My time at The Lodge started at 7pm last Friday. I was invited to sample their menu and was eager to get started. My first impression was that The Lodge was inviting and would be a great place to gather with friends for fantatic food, delicious drinks, sports and hanging out. I immediately noticed that the walls were painted a deep red, there were multiple big-screen TVs (and a projection screen!) lining the restaurant. 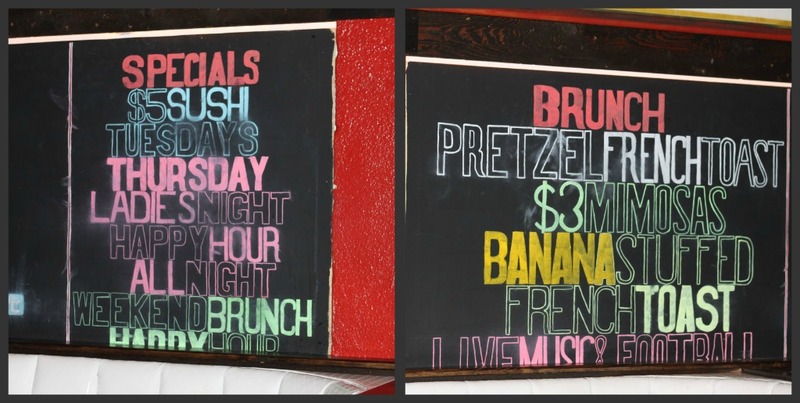 Drink and food highlights were proudly displayed on chalkboards against a main wall and the area behind the bar. Everyone was laughing and enjoying what they were eating and drinking. We were greeted by the manager, David, and led to our booth which had a "Reserved for Jennifer Buggica" sign that, I admit, made me a little giddy. David introduced himself and sat with us, explaining the concept of the restaurant, where they've been and where they're going. Having not been to The Lodge before, David and Chef Carlos prepared a sampling of the cuisine The Lodge has to offer. The Lodge's dinner menu is composed of Appetizers, Almost Famous Sliders, Crisp Salads, Lodge Sushi, Brick Oven Pizzas (offered in full, half and quarter sizes), Mac-N-Cheese, TV Dinners, Sweets & Sides and Open Flame Grilled Burgers and Sandwiches. While waiting for our first nibble, I ordered a white sangria and a State Fair Appetizer Platter for Two, which consisted of Crispy Calamari, Pot Stickers and Baby Corn Dogs. Each item came with its own dipping sauce: Marinara for the Calamari, Sweet Sesame Soy for the Pot Stickers and Mustard Aioli for the Baby Corn Dogs. The Mustard Aioli was great, with the typical mustard taste, only more creamy and also sweeter. Next, we were given Lodge Salads. 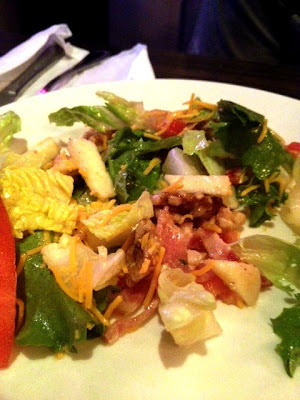 Mixed greens, apple, bacon bits, tomatoes, walnuts and cheddar cheese, tossed in a sherry shallot vinaigrette, the salad more complex than one would think, and was so different from the typical salad you'd find elsewhere. I honestly would never have thought to throw these ingredients together in a salad, but it worked wonderfully. And besides, you can never go wrong with a mix of sherry and shallots. At this point, David came back out to sit and chat. Upon noticing that my white sangria was a little low, he offered to bring me a Seabass Martini, a drink he personally created. 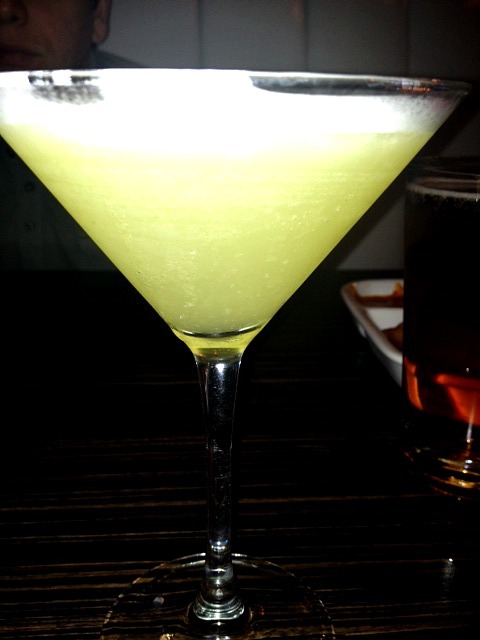 The Seabass Martini is made with Malibu, Peach Schnapps and Pineapple Juice, and topped with Champagne. This martini was so good and definitely something I'll order again. Refreshing and light, its popularity is no surprise. Buffalo Chicken Mac-N-Cheese. The Lodge has a special section of the menu dedicated to Mac-N-Cheese, which makes me believe I'm not the only one obsessed with this side dish. The other choices include Regular, BBQ Chicken, Italian Meatball and Chicken Parm. 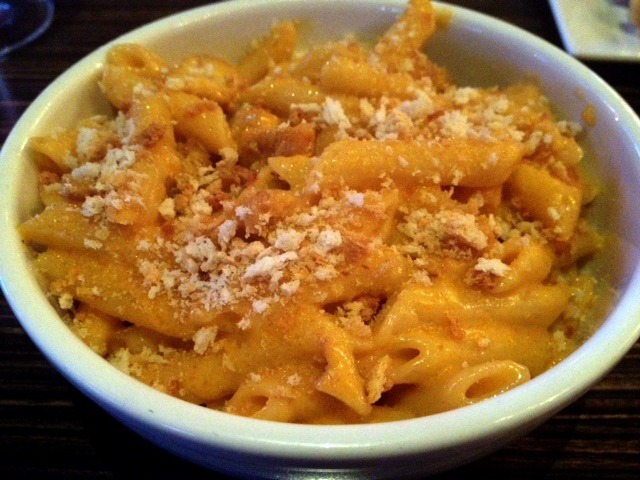 While the macaroni is great by itself, the real highlight of this particular flavor was the bits of buffalo chicken and the crispy breadcrumbs. This Mac-N-Cheese had a nice kick to it. Tempura Fried Sushi. I can honestly say that it is the best sushi I have ever tried. 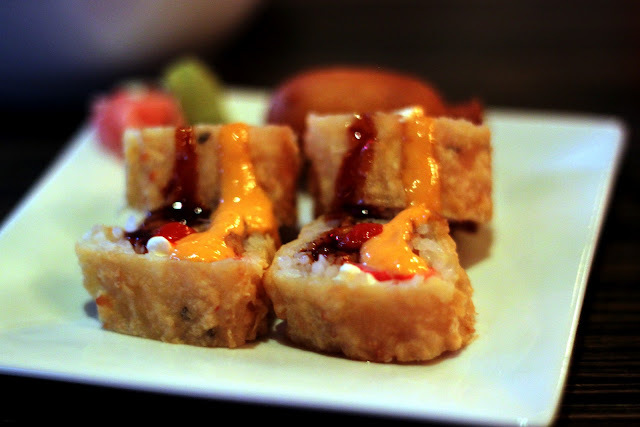 The Tempura Fried Sushi is made with spicy shrimp and crab rolled with crispy onions and cream cheese then tempura fried and topped with Kabayaki sauce and Sriracha Aioli. Honestly, I was sold at Sriracha, but the sushi continued to impress. It was perfectly fried and there was a nice ratio of all the fillings so nothing was overpowering. Popcorn Chicken. 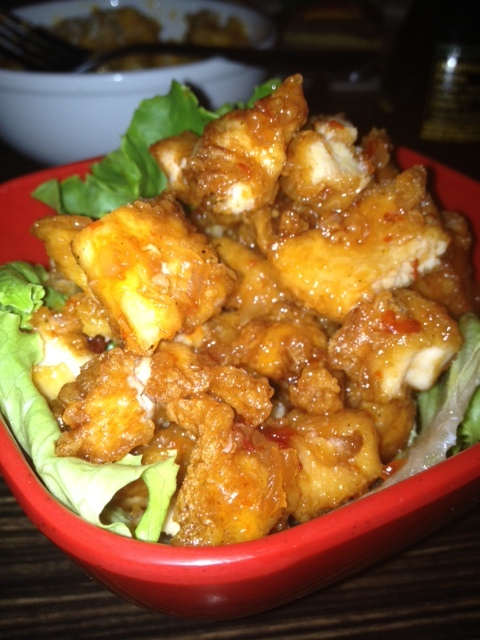 This chicken has a sweet and sour glaze and is not yet available on the regular menu. They have it available some nights on the same menu with their specials and if you see it, it's a must-order! One of my favorite dishes of the whole night, this chicken's glaze is simply delicious. It was savory, juicy and sweet with a slight kick. Buffalo Calamari and Sweet & Sour Calamari. The Lodge will be doing a slight revamp to their menu soon; neither of these are available on the regular menu yet, but we were lucky enough to preview them. 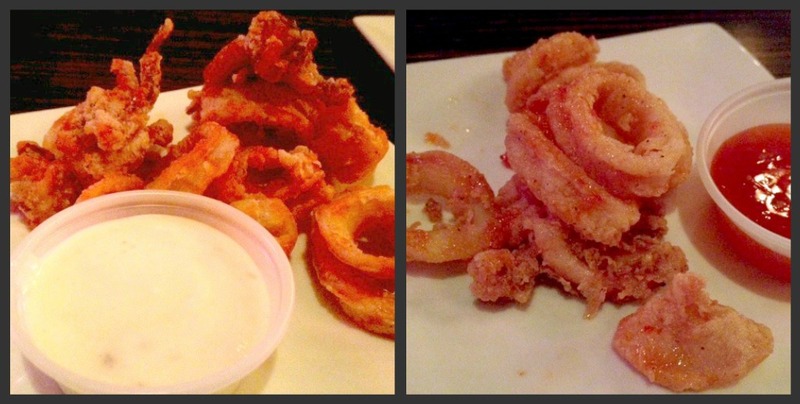 I thought both had great flavor and the dipping sauces were wonderful too. Sweet and Spicy Cucumber Salad. This salad was brought out as our last side before dessert. 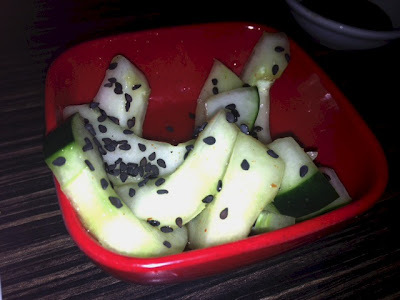 Cucumbers are at the top of my list of favorite fruits and cucumbers paired with a vinaigrette is so palate-cleansing, refreshing and delicious! I highly recommend getting this side. Fried Raspberry Cheesecake with ice cream. What a perfect end to our meal! Even though it was fried, the dessert was not heavy. 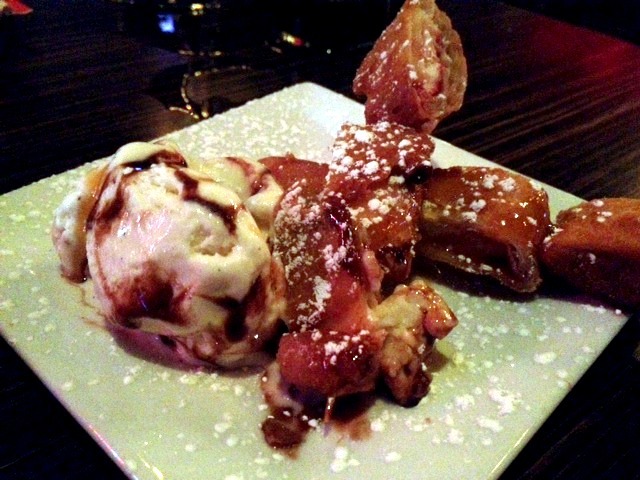 The hotter fried cheesecake mixed with the cold ice cream had exceptional flavor. Finally, we were treated to their Blue Long Island fishbowl! A massive fishbowl with plenty of fresh fruit and my favorite, dried ice, it was too large to finish between two people, but it was fun and tasty! The Lodge's bar was pretty impressive. They feature an extensive collection of beer, wine and liquor. Wines, sake, sangria and classic cocktails are offered on the menu. Group drink dispensers are available and you can always find a number of tables partaking in either the fishbowl or these dispensers. 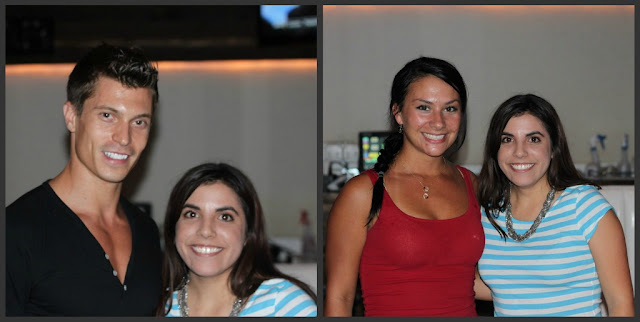 The Lodge features a daily happy hour from 11:30am-8:30pm (until 7:00pm on Fridays and Saturdays) with $3 select drafts, $4 select wines, $5 select martinis, $5 Sangria, $5 Svedka & Call Cocktails, $6 Jager and Patron shots and more! Promoters from liquor companies are also present if you want to try their brand. Last Friday, we happened to try Bushmills Irish Honey Whiskey. Tuesdays- $9 Grill and Chill and Yeungs and Wings. This special includes an Open Flame Sirloin Burger, Turkey Burger or Grilled Chicken Sandwich plus any 3 sides! Or, a dozen wings and a pitcher of Yuengling for only $9! Wednesdays- WTF Wednesdays?! which includes $5 sushi rolls, $5 burgers, $5 full pizzas, $5 for a dozen wings and $5 domestic beer pitchers. Thursdays- Ladies' Night. A group of 4 or more ladies receive a complimentary bottle of champage and Happy Hour all night long for everyone. Sundays- Industry night with 51% off with employment verification! As the night goes on at The Lodge, the lights dim more, the music gets a little louder and it becomes more like a night lounge. A DJ plays Thursday-Sunday nights and they have a go-go dancer Friday and Saturday evenings. During the weekend The Lodge regularly gives away a bottle of Patron to the group that sings "Sweet Caroline" the loudest! Also, on Saturdays and Sundays, come to The Lodge for their brunch and $3 mimosas! I know I am looking forward to trying their NYC Pretzel French Toast and their Monterey Hash. When visiting The Lodge choose a table inside or outside. The patio features live music; we were treated to a live reggae band. If you are looking for a place to watch your favorite sports, The Lodge is it. With a vast number of TVs, you can find your favorite sports events here nightly, including the UFC fights. And! The Lodge was gracious enough to supply gift cards for a giveaway! Enter using Rafflecopter below (***IF YOU DO NOT SEE THE GIVEAWAY, MAKE SURE TO CLICK "READ BELOW" UNDER MY SIGNATURE***). I have 3 gift cards (2 for $25 and 1 for $50) up for grabs and no one person can win more than one gift card. You have a total of 9 potential entries. This giveaway will run until Thursday night, April 19th, and the winners will be announced on Friday, April 20th. If you have any questions regarding Rafflecopter or this giveaway, please email me at jensfood@yahoo.com. A huge thank you to The Lodge, David, Erica, Carlos and everyone who made this experience a great one! Oh sweet mother. I want to go there now! I totally want to try the sushi, or the buffalo mac and cheese, or...I mean I could continue here! Love all the buffalo items on the menu. Buffalo burger sounds great! I've always wanted to go there! The martini sounds amazing. Tarantula Sushi!! I would love to check out their $5 sushi night too. The popcron chicken could get me to that tv show my 600 lb life so GOOD! The Lodge is one of my favorite places in Tampa. The food is GREAT! Interesting point of concept! Might need to check it out my next FL visit. I really wanna try that salad!! And the martini, fair food sampler.. Basically everything you described with the exception of anything with Cream Cheese.. Allergies. I absolutely love the Lodge's drinks, and the food I've tried has been amazing too. I can't wait to go back there again sometime! Forgot to tell you what I'd order: definitely the tempura sushi! The sauces alone sound scrumptious. 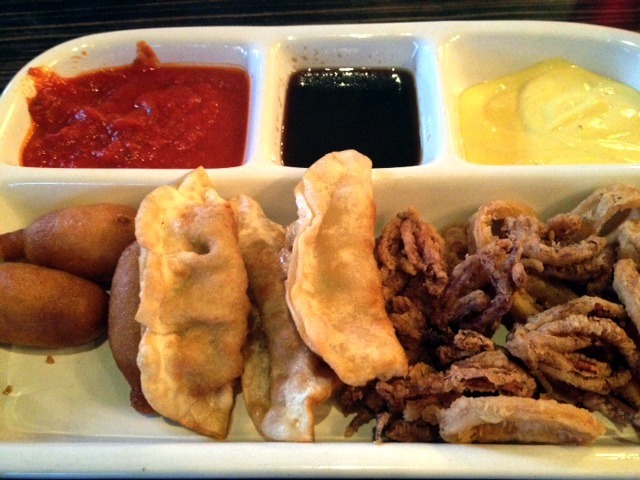 I'd get the trio of dips, meatball pizza and a Seabass Martini! OMG I want to go to there. mac & cheese pizza, please! I love the loaded mimosa with mango juice! And I agree, the buffalo mac-n-cheese is great! I've never been to The Lodge before...looks like a fun place! I think I'd want to try the Asian pulled pork sliders - those sound yummy! Seriously can we go sometime? I want! I want the breakfast burger! Yum! I would try something off the brunch menu like the NYC Pretzel French Toast! I would try the Italian sliders! I would try the Buffalo Mac and Cheese ! I would like to try the sushi and the specials for drinks.